So out of that 10 seconds, you don’t want your website to take up any more time than is necessary. You need your website to load as quickly as possible. Page load speed is the amount of time it takes for your website to load. 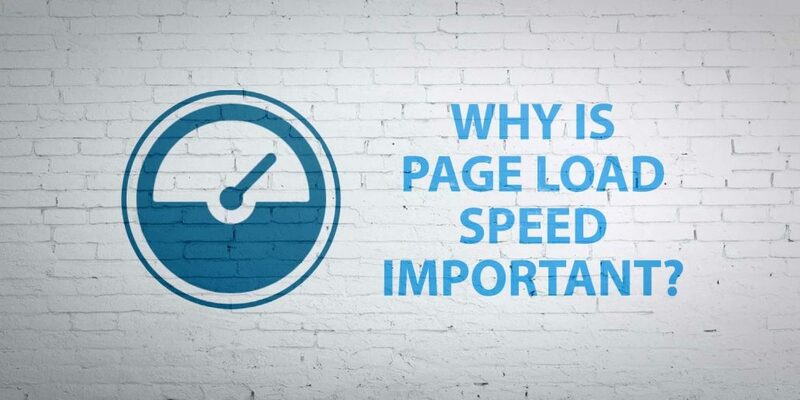 Page speed can depend on a variation of factors such as; the design of your website, your hosting your data centre’s connection. The better optimised your website is and the better quality hosting you have, the faster your website will load for most visitors. You won’t be able to control certain aspects such as a visitor’s location and their connection speed, but you have control over many other aspects. There are several reasons why page speed matters. The main reasons are user engagement/conversion and search engine rankings. Visitors are far more likely to stay on your website if it loads quickly and your website has been designed with User Experience in mind. Google and other search engines will penalise your website if it loads slowly by dropping you down from visible search engine rankings. Your website’s page load speed is critical for user engagement/UX. A one second delay in page load speed can cause up to a 7% reduction in conversions. A two second delay can result in a 20% increase in shopping cart abandonment by users. Those are some scary numbers! Slow page load speeds cause unhappy visitors and less paying customers, reducing your revenue and ROI for your website. In 2010, Google announced that it would start incorporating page load speed into its ranking algorithm. In July 2018, a new ranking factor set by Google is mobile page load speeds. Your website’s SEO friendliness is critical in terms of gaining online visibility and increasing web traffic. Decreasing your page load speeds should be a primary focus of your SEO strategy. Page load speeds impact your SEO in several ways. Google’s algorithm includes a direct page load ranking factor. However, part of Google’s ranking algorithm focuses on user behaviour, which includes how much time a visitor spends on your website, how many pages they view, and most importantly if they bounce. So page load speed alone isn’t enough – the bounce rate will also affect your rankings. Faster page load speeds tend to lead to a higher conversion rate. Sorting out your page load speeds and reducing your bounce rates will get your site ranking higher in the search results but it will also result in more conversions compared with a slower website. Hosting: It’s super important to choose the right hosting solution for your website. Inexpensive shared hosting plans can damage your page speeds. Choose a hosting provider that values page speed and uptime. Image Optimisation: Images that are not properly optimised can have a big impact on your page load speeds. Browser Optimisation: Your website should be QA Tested on a variety of browsers and mobile devices since they do not load your site in the same way. Advertising Overload: Visitors don’t like to see lots of ads which will increase bounce rates and they can also decrease load speed. Theme Selection: Depending on whether you’re using a free, paid for or custom designed theme for your chosen CMS, it can slow load speeds depending on how many animations and complex content display options you have selected. Plugins: These have the potential to considerably lower page load speeds. Using a cache plugin can often reduce your load speed times significantly, as well as reducing the number of plugins you are using. Read out next blog post out this week on ways to reduce page load speeds on your WordPress Website. You can always contact us for a free consultation on how to speed up your page load speeds. We also offer great managed service hosting plans with page load speed in mind.